Cloning a piece of hardware is an excelent way to learn about how it is designed, and how it works. This is often viewed as a seedy trade inwhich people bastardise the hard-work of honest engineers and other designers to produce the same product without the overhead cost of design and marketing. Unfortunately in my experience design documentation is almost always lost and the only way to recover (or sometime resume production of) a product is to clone it and there is little discussion on techiques for achieving this. Generally when I 'clone' a product, I build an exact replica (in so far as component layout and electrical connections). Then I go looking for what can be made cheaper. Then better. Then the maintence cycle begins. I like to use high-resolution photography and logic probes to start with; however grainy photographed pages from a foreign trade magazine from a random website is more than enough to clone a product and start development. Take for example the Solid State Diskdrive for the IBM XT featured on K. Giannopoulos' website (microwave.gr:Build your own Vintage PC-XT Computer). 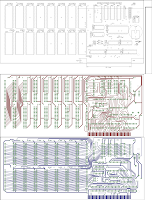 From these massive bitmaps, and roms we can produce plans for a clone and then some. To obtain the reference board art start by tracing the bitmaps with Inkscape. This allows evaluation the quality of the reference material and gives me a reference for the wiring of the first clone. Next using the outside corners as reference points calculate how much to rotate these layers to align their edges horizontally. In this example because the bottom layer is clearly out of square as the angle does not match, this could be because of perspective, a transform can fix that if it is flat. There is also noticable distortion bacause the pages were not pressed flat when the picture was taken, but maybe I will get lucky and manage to align it anyways. The red top layer does not completely align with the blue bottom layer. There are also a number of 'broken' traces where the line did not render very well. Even if this image was rescaled a pcb made precisely to this image the pcb would require significant repairs where the components do not fit, where the layers do not connect and where the wires are disconnected. Fixing this would be quite difficult. If it were in alignment we could then replace the polygons with wires and convert this into gerber format using a script. But it's not so I will be drafting the board art manually. 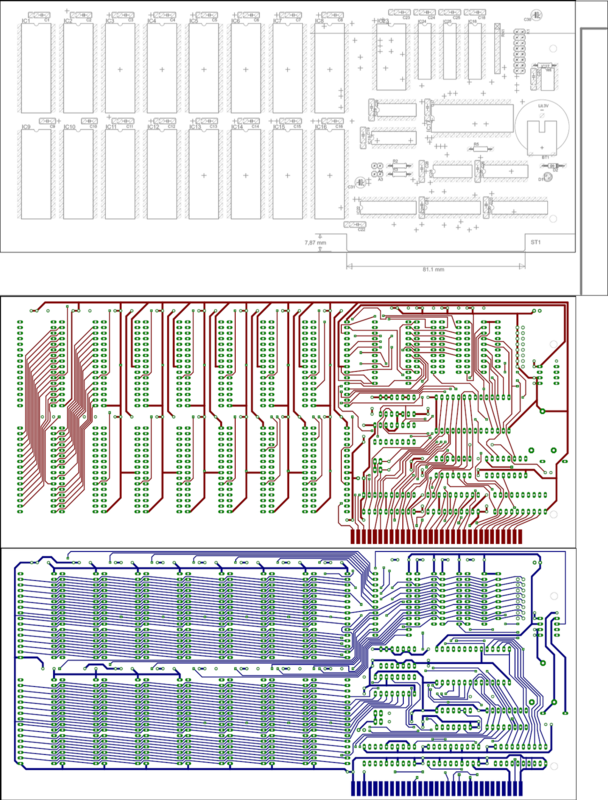 Fortunately this website also posted a schematic and parts list. Step 2: Using the reference material. Add all of the parts necessary to a new Eagle schematic. I found that I needed to add two 'new' comonents to the library: the three lead capacitor and the DIP32 RAM. Working from one corner to the other recreate populate the schematic and board with approximately the same layout. Once populated wire the schematic and board as close to the original as is practical. The reference art can be coloured to track progress and distinguish different signals easier. I think lavender is a fine colour for the data bus. While I was doing this I made a few interesting discoveries: most significantly was the omission of CLK from the cardedge to IC19 on the original schematic, without this a clone card made only from the schematic would not work. The Address and Data lines were also shuffled around by the orignal designer to help with board layout. This is good since even with the bits shuffled around each address is still unique and the data (provided it is always stored in the same order) will still read back correctly. As evidenced by the vias inside the array of memorychips the previous designer got bored and used the autorouter resulting in some spectacularly stupid wiring. I've duplicated most of the 'stupid' so that my colleagues will not harass me about differing from the original "too much", though while linking the data and address lines from the memory chips I made a hash of it since I intend to design that out entirely. And here is the result of eleven hours of unpaid work: a clone of the original board, minus some stupid, plus some sloppyness when I got bored. Now that we have a hardware/software compatible clone we can make it cheaper by substituting components. Note: I was unable to upload the PDF, SVG, brd, sch and lbr files I had intended to illustrate this post with. I am also disinclined to seekout a file host for these if nobody asks for them. Edit: I have been contacted, links to follow. Edit: Build your own Vintage PC-XT Computer files are availble in the Solid state disk section. `ell, only one letter off. Eazy, like riding a bike.